Cauliflower hummus. Huzzah! This paleo and Whole30 hummus is creamy, nutty, and packed with flavor. I finish it off with a generous splash of extra virgin olive oil and a few shakes of za’atar for an easy, low carb, umami packed snack that will have your tastebuds rocking. If you’ve been reading this blog for any length of time, it should come as no surprise that I seriously love cauliflower. It’s such a versatile vegetable, especially if you’re exploring a low carb lifestyle or doing a Whole30. And even if neither apply, cauliflower is damn tasty, super nutritious, and an excellent canvas for flexing those creative culinary muscles. Creamy without cream soup? Totally. Today’s adventure in cauliflower land brings us to hummus. Creamy, nutty, bean-free hummus. Cauliflower hummus! Yes, you can totally make a paleo and Whole30 hummus that tastes almost identical to the classic version, and it’s just as easy. Then we’re going to amp up the flavor factor even further with a few generous shakes of homemade za-atar spice. 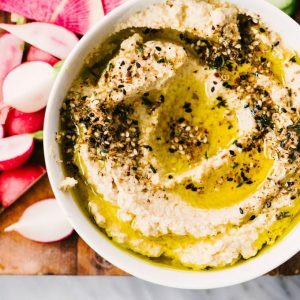 Hold onto your taste buds friends, because this cauliflower hummus with za’atar is a seriously delicious ride. >>> Pin it now! Click here to pin this recipe to your Paleo, Whole30, Keto, or Low Carb Recipe board on Pinterest! The base of my paleo hummus is roasted cauliflower. Roasting gives the finished hummus a nutty, rich flavor. Grab yourself a head of cauliflower and dice it into uniform florets of about 2″ each. This is a great video tutorial that’ll turn you into a cauliflower-choppin’ pro in no time. Spread the florets onto a baking sheet and drizzle them with a few glugs of olive or avocado oil, then roast until they’re golden brown and crispy. Ahh, crispy bits. Those browned and caramelized spots are packed with flavor. YUM! Toss a few cloves of garlic into the bowl of a food processor along with the juice of a whole lemon. I use three large cloves of garlic, and it gives the finished hummus a distinctive garlicky bite. Scale down the garlic for a more subtle profile, but do include at least one clove. Process the garlic and lemon juice until the garlic is completely minced. Add the roasted cauliflower to the garlic and lemon juice along with tahini and seasonings, then pulse until the cauliflower resembles coarse crumbs. Finally, add a generous pour of good quality extra virgin olive oil and process until the hummus is super smooth and creamy. 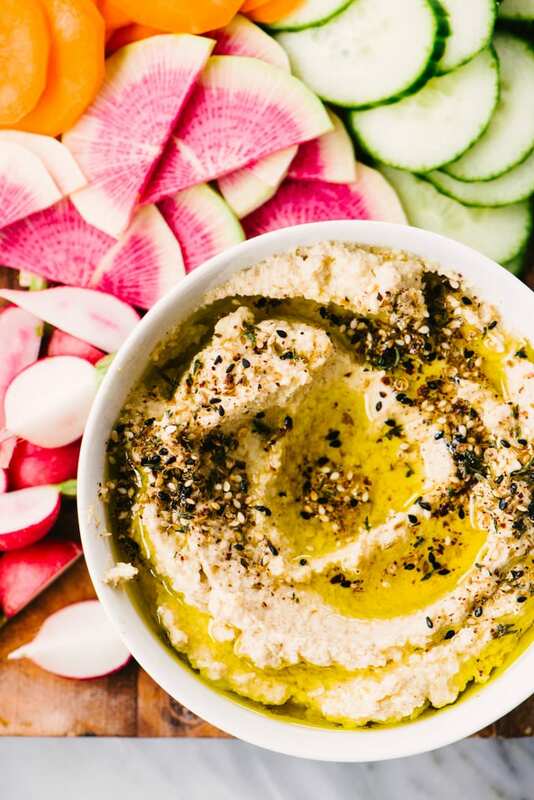 You’ll want to stop the food processor and scrape down the sides with a spatula a few times to ensure you incorporate every bit of roasted cauliflower into the hummus. If you find the consistency is too thick, add a bit of water, one tablespoon at a time, until it reaches the desired consistency. Before you consider this “done”, taste a spoonful and check for seasoning. Add a little more lemon juice, salt or cumin until the flavor pops. Voila. Smooth and creamy paleo cauliflower hummus. Finish of this bowl of umami packed awesome-sauce with a healthy drizzle of extra virgin olive oil and and a sprinkle of homemade za’atar. 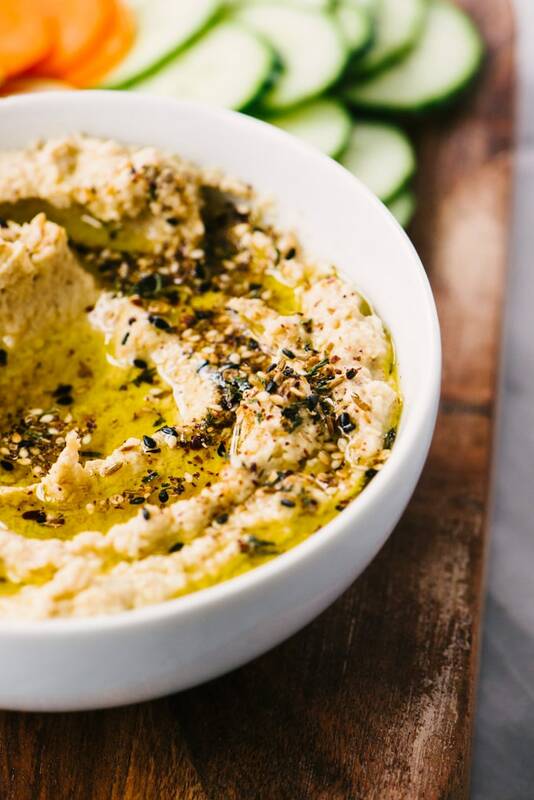 Za’atar and roasted cauliflower hummus are a match made in heaven. A few shakes on top takes this recipe from wonderful to OMG WOW. And if you’re not feeling in the mood to get all homemade spicy, you can purchase za’atar at a local middle eastern grocer, or at a specialty spice shop like Penzeys. I’ve also found it at my local co-op and Whole Foods. To keep this recipe completely paleo and Whole30, serve with sliced vegetables like carrots, radishes, cucumber, jicama, and snap peas, or a grain free bread, like this Seeded Loaf from With Food and Love. PIN IT NOW, MAKE IT LATER! 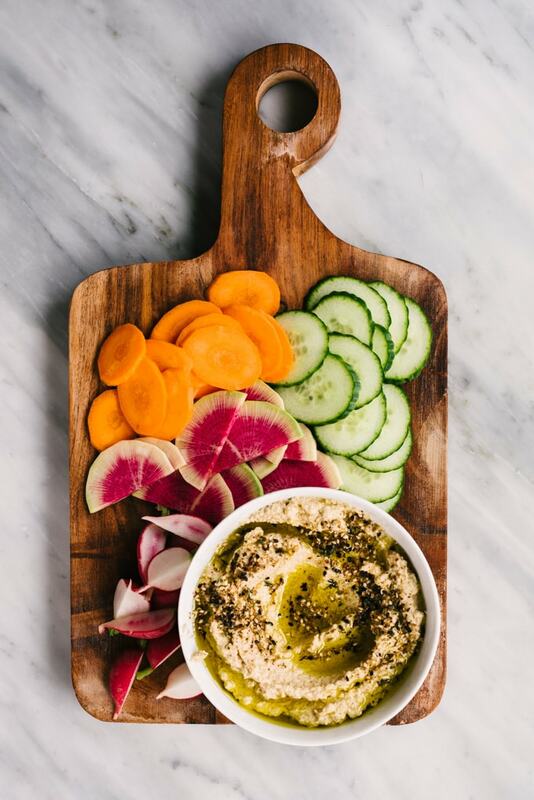 CLICK HERE TO PIN THIS Paleo and Whole30 Recipe for Cauliflower Hummus. This cauliflower hummus is creamy, nutty, and packed with flavor. Serve it with sliced vegetables and/or seed bread for an easy paleo and whole30 snack. 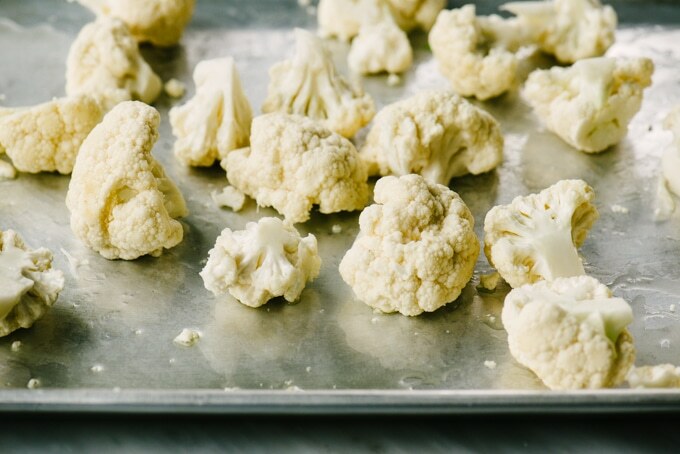 Chop the cauliflower into florets, then spread the florets onto a baking sheet in a single layer. Drizzle the florets with the olive or avocado oil, then toss the cauliflower with your (clean) hands to coat in the oil. 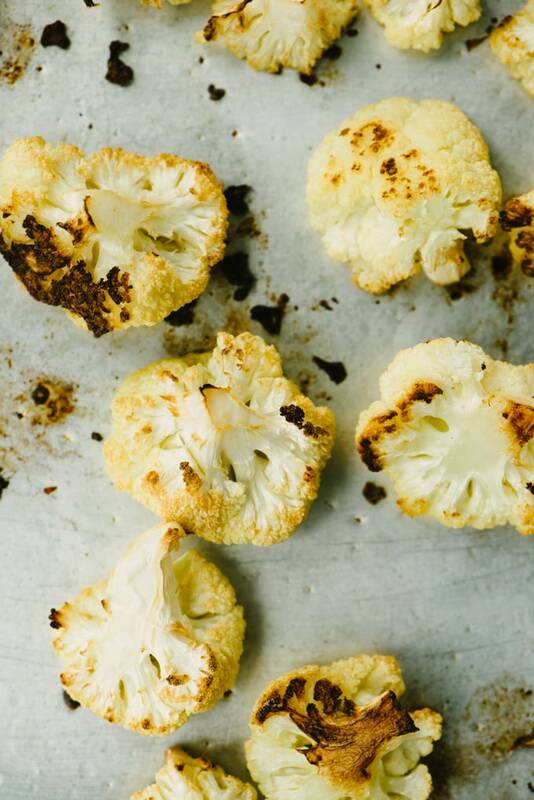 Roast for 25-30 minutes, or until the cauliflower is soft, caramelizing in spots, and can be easily pierced with the tip of a sharp knife. 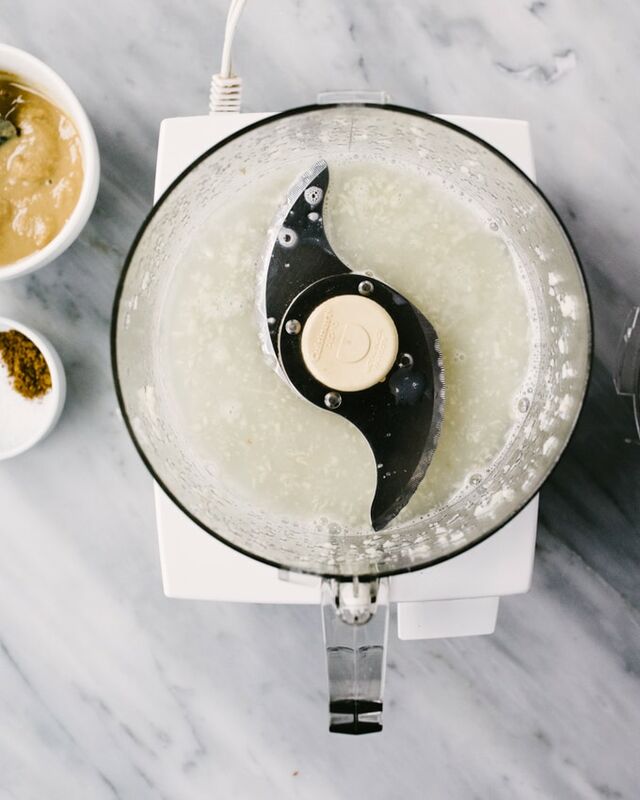 Add the smashed garlic and lemon juice to the bowl of a food processor. Pulse a few times until the garlic is minced. 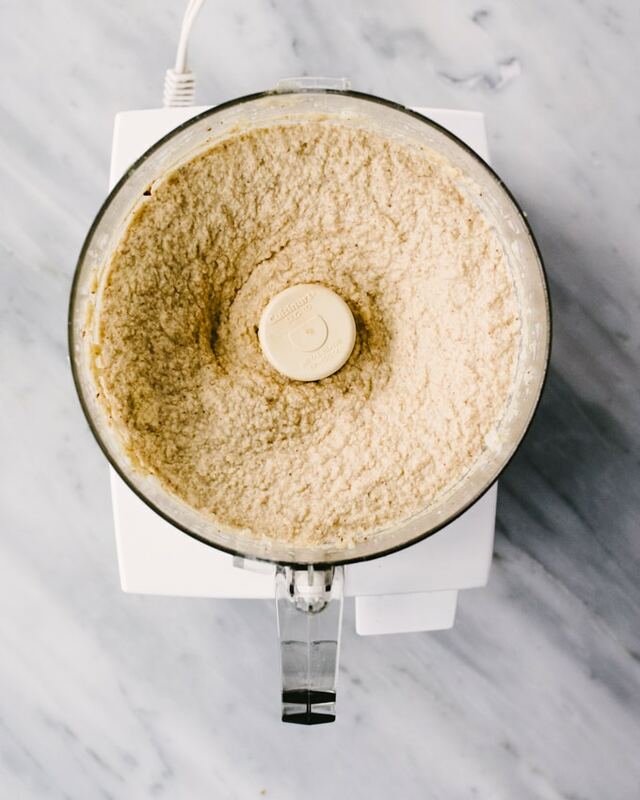 Add the roasted cauliflower to the food processor, along with the tahini, salt, and cumin. Pulse several times to break up the florets. Flip the motor to continuous. With the motor running, pour 4 tbsp extra virgin olive oil through the feed tube. Continue processing until the hummus is smooth, stopping one or two times to scrape down the sides of the bowl. Scrape the hummus into a bowl and drizzle with the remaining 2 tbsp extra virgin olive oil. 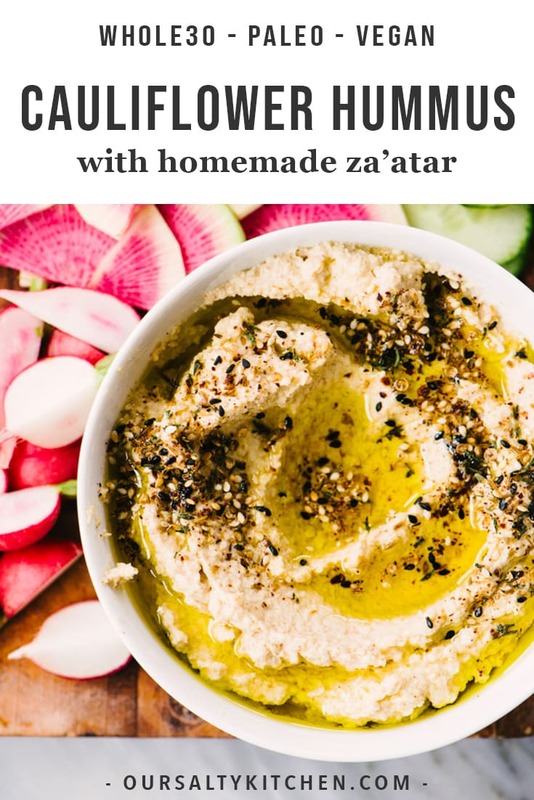 Dust with the zaatar, and serve immediately with sliced vegetables or grain free seed bread. Store leftovers in a lidded container in the fridge for up to three days. this is absolutely gorgeous 🙂 love the idea of using cauliflower and I love that you made your own za’atar, I’m obsessed with za’atar spice! Thank you! The homemade za’atar was such a happy accident. We moved last summer and I haven’t found my go-to middle eastern shop yet, so I decided to make my own, and I loved it SO MUCH MORE. I’ll never buy it again. (although a friend recently teased me with a stash she brought back from Israel! ).